A Closed World is a Flash-based browser game created in summer 2011 at the Singapore-MIT GAMBIT Game Lab (now the MIT Game Lab) as part of its summer program in research-informed design. A team of students from the US and Singapore were tasked with creating a game that included queer-relevant content in a meaningful way, as part of a research project exploring how a design team would engage that process. 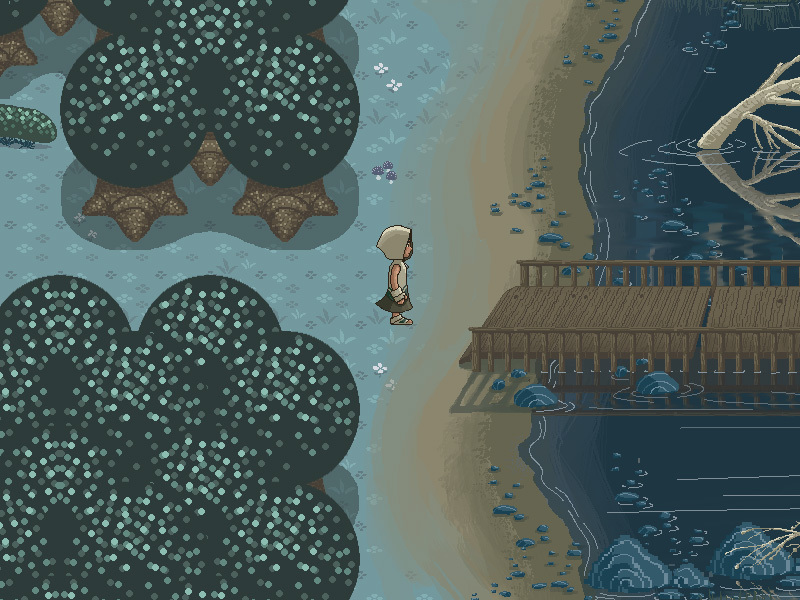 Inspired by console role-playing games such as Earthbound, A Closed World presents the story of a youth whose lover abandons them to head into a forbidden forest from which none have returned. The player takes the youth through the forest, battling representations of their personal issues via menu-driven “combat” using logic, ethics, and passion, rather than traditional swords and sorcery. The trailer for the game appears below. At the game’s outset, players are asked to choose whether they are a boy or a girl. The resulting sprite (pictured above) looks the same, regardless of the player’s choice. The game then randomizes the pronouns used for other characters in the game, with one exception: the player-character’s lover, who they are chasing in the game’s story, returns home to marry someone chosen by their parents. The lover’s new spouse’s gender is always the opposite of the one chosen by the player at the beginning of the game. Thus the player may end up being straight in a homonormative world, or queer in a heteronormative one, depending on the resulting random assignment. A Closed World (n.d.). Retrieved from http://www.gamesforchange.org/play/a-closed-world/. Alexander, L. (2011, September). Interview: How GAMBIT’s A Closed World Tackles Sexuality, Identity. Gamasutra. Retrieved from http://www.gamasutra.com/view/news/36951/Interview_How_GAMBITs_A_Closed_World_Tackles_Sexuality_Identity.php. Curtis, T. (2012, January). Educated Play: A Closed World. Game Developer Magazine, 58-59. Retrieved from http://twvideo01.ubm-us.net/o1/vault/GD_Mag_Archives/GDM_January_2012.pdf. Harper, T. (2011, October). Gay-for-play: addressing the challenge of relevant gay game content. Paper presented at the Association of Internet Researchers conference, Seattle, Washington.